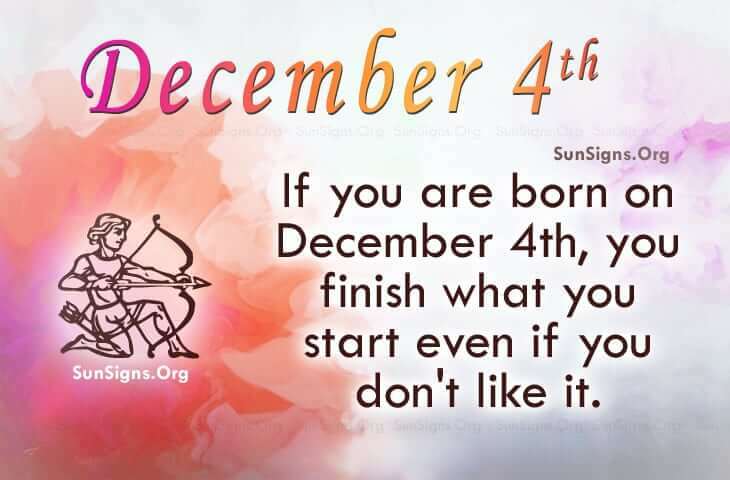 Famous people born on DECEMBER 4 do things that are not necessarily to their liking but you don’t gripe about it. It’s the kind of thing that makes them an exceptional Sagittarius. They realize it’s not a perfect world but they do it to make it a better place. Their parents may have instilled values in them that they have carried with them long into their adult years. Mainly to stay grounded, they keep their friends and family close. However, as a downfall, famous celebrities of December 4 can be indecisive or they may have a tendency to have many projects going on at the same time leaving room for errors and uncompleted work. They are able to express themselves and have the ability to get themselves out of situations that they seem to get into. Normally, they don’t like conflict or chaos so they will turn in the other direction when faced with most situations that involve negative activity. On that note, they should avoid many opportunities that allow them to drink or use drugs. Famous people born on DECEMBER 4th have trouble finishing what they start. They have too many things going on at once and this could be stressful at some point. However, they love the challenge and surround themselves with those with the same interests.